EARLY PLANNING ON THE CORRIDOR: According to Hugh Pomeroy, chief planner for the Westchester County Planning Commission, the New England Thruway was to be a controlled-access route along the Hutchinson River Parkway-US 1 ("New England") corridor. The route of the New England Thruway was to be on the northerly side of the New York and New Haven Railroad (now the Amtrak-Metro North New Haven rail line), along land acquired by Westchester County in the late 1920's for the never-built Pelham-Port Chester Parkway. The New England Thruway does not actually go through any part of New England, cutting only through the northeast Bronx and the heavily suburban eastern shore of Westchester. As early as 1936, officials saw the need to provide relief for both commercial and pleasure traffic along the US 1 corridor. That year, the Regional Plan Association recommended the construction of an expressway along the Pelham-Port Chester Parkway right-of-way. As an integral part of the regional network, the proposed expressway was to connect the Triborough, George Washington and Bronx-Whitestone bridges with Connecticut. The combined New England Thruway and Connecticut Turnpike were designed to relieve congestion on US 1 (Boston Post Road) and the Hutchinson River-Merritt Parkway complex. Prior to the construction of the New England Thruway, the Boston Post Road had been the only route open to trucks and buses between New York and New England. The limited-access Hutchinson River and Merritt parkways, both constructed in the 1930's, were open only to passenger cars. Construction of this route will relieve congestion on the Boston Post Road and the Hutchinson River Parkway, leading to New England. The Boston Post Road is the most congested mixed-traffic route from New York City to the north and east, and is located through the main business sections of the City of New Rochelle and the villages of Larchmont, Mamaroneck, Rye and Port Chester. The Hutchinson River Parkway is the most overcrowded artery limited to pleasure vehicles in Westchester County. The new route is approximately 15 miles long and parallels the New Haven Railroad. It joins the Boston Post Road at the Connecticut state line near the Merritt Parkway to the north, and with Eastern (Bruckner) Boulevard and the new Hutchinson River Parkway Extension, forming corridors to the Triborough, Bronx-Whitestone and other bridges to the south. The express highway for mixed traffic should be built for three lanes in each direction, with grade crossings eliminated by 49 bridges and five viaducts. The cost of constructing this artery is estimated at $14,400,000. More than 75% of the right-of-way has already been acquired by Westchester County, representing a cost of approximately $5,850,000. The additional land required is estimated at $1,900,000 in Westchester County, and the right-of-way in New York City lies entirely within Pelham Bay Park. This 1959 photo shows the northbound New England Thruway (I-95) at EXIT 15 (US 1) in New Rochelle. (Photo by New York State Thruway Authority via Todd Berkun. THE THRUWAY AUTHORITY TAKES OVER… In 1950, the New York State Legislature approved construction of the New England Thruway, and placed jurisdiction over the road to the New York State Thruway Authority (NYSTA). The following year, the NYSTA decided to construct a barrier toll plaza in Larchmont to finance the thruway. Much of the right-of-way for the project already had been acquired for the unbuilt Pelham-Port Chester Parkway project, except for a 1½ -mile-long section through Larchmont. … BUT STIRS CONTROVERSY: The project required the demolition of the Larchmont railroad station and nearby businesses, raising the ire of Patrick B. McGinnis, the president of the New Haven Railroad. The NYSTA compensated by building a multi-million dollar parking lot and railroad station above the proposed highway, but even this did not please McGinnis, who said, "Why should the people of Larchmont agree to anything that makes them climb steps?" Construction of the elevated station and parking lot required the closure of Chatsworth Avenue for nearly a year. Further north in Mamaroneck, the local school board opposed plans for the cloverleaf interchange at EXIT 18 (Mamaroneck Avenue), where exiting traffic was thought to pose a hazard for students at nearby Mamaroneck Avenue School. Residents also opposed the plan, as they feared that property valuations would plummet. Near the Bronx-Westchester border, Theodore Kazimiroff, president of the Bronx County Historical Society, convinced engineers to relocate the thruway to the north of Split Rock. The large boulder in Pelham Bay Park had not only served as an Indian outlook, but also was the site of a daring engagement by the Revolutionary Army. On this site in October 1776, Colonel John Glover and his Marblehead Regiment from Massachusetts first engaged the British, allowing a retreating General George Washington to escape. Toward the end of 1954, village, town and county officials finally joined together in asking for swift construction of the New England Thruway to alleviate congestion on Boston Post Road (US 1). THE THRUWAY BECOMES AN INTERSTATE: Under the Federal Highway Act of 1956, both the New England Thruway and the Connecticut Turnpike became eligible for Interstate highway funds. Subsequently, both toll roads became part of Interstate 95. By 1957, the Westchester section of the New England Thruway was nearing completion, while construction continued on the thruway in the northeast Bronx. THE NEW ENGLAND THRUWAY OPENS: On October 15, 1958, Governor Harriman of New York and Governor Ribicoff of Connecticut opened the entire length of the thruway between the Pelham Parkway in the Bronx and the New York-Connecticut state line. The New England Thruway and the Connecticut Turnpike created a 144-mile-long express road from the Bronx to Rhode Island. Immediately after the dedication ceremony, Harriman traveled several miles south to the Bronx to break ground on the I-95 section of the Bruckner Expressway. The Bruckner Expressway, which connects the New England Thruway with the East River crossings, was completed in 1961. The cost of the 15.3-mile-long, six-lane New England Thruway was $91.7 million, or approximately $6.2 million per mile. Although most of the thruway was built on land already set aside for the unbuilt Pelham-Port Chester Parkway, additional right-of-way acquisition costs amounted to a relatively high $28.3 million. 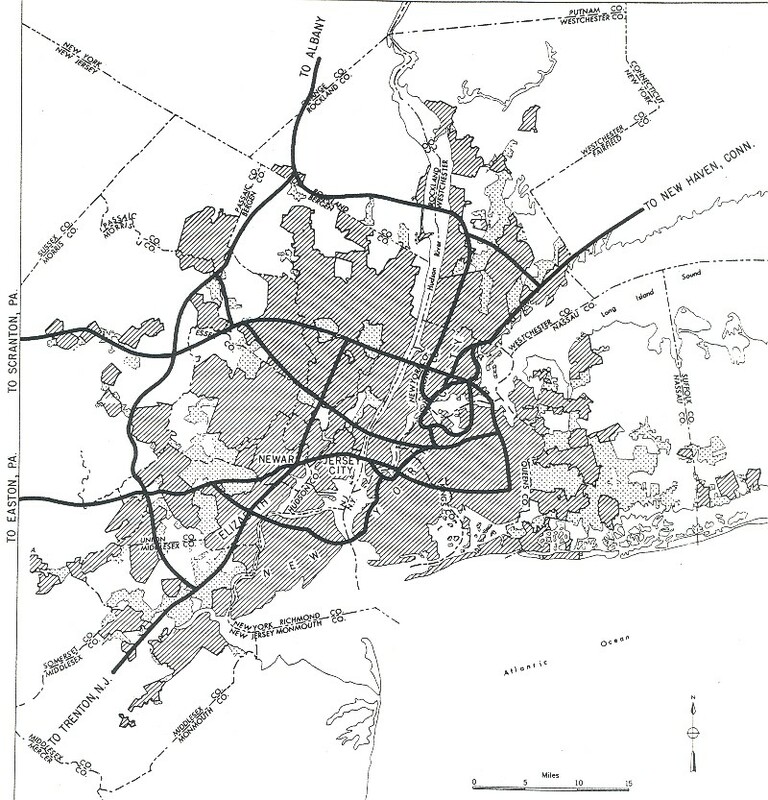 The thruway through the Bronx and north of New Rochelle can be used without charge because Federal funds were used for construction through these areas. When the thruway opened, both motorists and residents complained that the road opened in a "raw" state. Work on installing lights, guardrails and fences, and on constructing some overpasses had not yet been completed. This finishing work took another six months. The New England Thruway opened with one of the few drawbridges found on the Interstate highway system. Officials at the NYSTA acknowledged that on average, vehicular traffic would be halted four times per day (averaging 12 minutes per opening) on the 150-foot-long, double-leaf bascule span to allow boats to use the Hutchinson River. From its opening in 1958 until the 1970s, the New England Thruway had its own unique identification shields. The New England Thruway shield was shaped like an arrowhead, with green lettering on a yellow background. A few of these badly faded signs can be found on side streets in the Bronx and in Westchester County. REHABILITATING THE NEW ENGLAND THRUWAY: In 1980, the exits on the New England Thruway were renumbered in sequential order, continuing the exit numbering sequence of I-95 along the Trans-Manhattan, Cross Bronx and Bruckner expressways (which received their exit numbers in the early 1970's). The route was renumbered to comply with a Federal regulation, and to eliminate a conflict of exit numbers in New York City that has caused confusion among police, fire and other emergency services. Before the change, EXIT 1 on the New England Thruway was Pelham Parkway. Today, this is EXIT 8B and EXIT 8C. Beginning in 1982, the New England Thruway underwent extensive rehabilitation, complete with new roadways and bridges, throughout the entire length of the route. Some of the highlights of the project were the conversion of the New Rochelle toll plaza from two-way tolls to northbound-only tolls during the late 1980's, and the replacement of the Hutchinson River drawbridge with a new high-level bridge in 1996. After 17 years of reconstruction, the inconveniences of four narrow lanes, two in each direction, sharing one roadway ended in 1999 with the completion of work near the New York-Connecticut state line. The NYSTA replaced the North Avenue bridge over the New England Thruway at EXIT 16 in New Rochelle. The year-long project was completed in 2002 at a cost of $7.2 million. The NYSTA rehabilitated two thruway bridges in the Bronx, and one bridge in Westchester County. The $2.7 million project was finished in 2003. In conjunction with the Connecticut Department of Transportation (ConnDOT), the NYSTA rehabilitated the Byram River Bridge at the New York-Connecticut border. Work on the $35 million project, which required some nighttime lane closures, was undertaken in 2004 and 2005. PROPOSED RELIEF FOR THE "HUTCH" AND US 1: In 1925, the Westchester County Parks Commission recommended the construction of a "Pelham-Port Chester Parkway" along the Boston Post Road (US 1) corridor between the Pelham-New Rochelle area and Port Chester. The Hutchinson River Parkway, which was being constructed parallel to the proposed Pelham-Port Chester Parkway, was also designed to relieve traffic on US 1. However, with the population growth of along the Long Island Sound corridor in Westchester County, it was feared that traffic on both US 1 and the Hutchinson River Parkway would increase. The inevitable development along this corridor necessitated construction of another parkway. Despite opposition along the proposed route of the parkway, the Commission appropriated $3.5 million for right-of-way acquisition in 1929. The next year, the Commission voted to extend the parkway 1¼ miles south to Pelham Bay Park in the Bronx, where it was to connect to the east-west Pelham Parkway. At that time, a stone-arch, grade separation bridge, which carried Murray Avenue over the still non-existent parkway, was constructed in the area of the Larchmont Metro-North station. Designs for the parkway, which was to be open to passenger cars only, were submitted and accepted throughout the early 1930's. Many of the bridges were to follow the design standards established by other parkways in Westchester County, Long Island and New York City. As designs were being submitted for the Pelham-Port Chester Parkway, the problems were just beginning. In 1933, the New York State Council of Parks recommended construction of the parkway as part of its five-year development plan, but the state refused to fund the construction itself. In response, the state legislature created the Pelham-Port Chester Parkway Authority, a separate legal entity consisting of members of the Westchester County Parks Commission. This entity had the authority to issue bonds and charge tolls to finance the parkway's construction. The Pelham-Port Chester Parkway Authority applied for construction loans to the Reconstruction Finance Corporation, but before it could do so, the project had to be approved by the federal Public Works Administration (PWA). In 1935, the loan application was rejected on the grounds that the proposed 25-cent toll would not generate sufficient revenue to cover principal and interest on the loan. The Pelham-Port Chester Parkway is of such importance as a traffic artery, interstate in character, connecting the City of New York with New England, that it should be constructed at federal or state expense. As in the past, advantage should be taken of every opportunity to secure state or federal funds, or both, in amount necessary to construct this important traffic thoroughfare. FROM PARKWAY TO THRUWAY: Realizing of futility of obtaining funds, the Parks Commission recommended turning over the parkway right-of-way to the state in 1942. In March 1943, the New York State Temporary Commission for Postwar Public Works Planning proposed building a highway along the right-of-way as a state and federal project after World War II. In 1949, the NYSTA proposed the New England Thruway along this route. For much of its route, the New England Thruway was to use the Pelham-Port Chester Parkway right-of-way. The sole exception was in Larchmont, where a 1½ -mile-long section of the new toll road (between EXIT 17 and EXIT 18A) was constructed along a new right-of-way along the Amtrak-Metro North railroad tracks. Vestiges of the original Pelham-Port Chester Parkway right-of-way remain visible today. The original Murphy Avenue overpass, which was constructed to allow a dual-carriageway road to cross under it, can still be seen. The original parkway right-of-way became a park. BRONX SERVICE AREA: A new service area, complete with truck parking facilities, should be constructed in the area of EXIT 13 (Connor Street) in the northeast Bronx. At the present time, there exists a 40-mile stretch along I-95 (from the Vince Lombardi service area in New Jersey to Fairfield County, Connecticut) without highway service areas. MORE REALISTIC SPEED LIMITS: The speed limits on the New England Thruway should be raised to 55 MPH in the Bronx and 60 MPH in Westchester County. SOURCES: Reports of the Westchester County Parks Commission (1926-1935), Westchester County Parks Commission (1935); "Freeways Are Now Urged," The New York Times (12/13/1936); "Vital Gaps in the New York Metropolitan Arterial System," Triborough Bridge Authority (1940); Highway Needs in New York State, New York State Department of Public Works (1949); "Let's Be Realistic About Thruways" by Hugh R. Pomeroy, Westchester County Planning Department (2/21/1950); "O'Dwyer Endorses Plans on Thruway" by Douglas Dales, The New York Times (3/07/1950); "Estimated Traffic, Revenue and Expenses on the New York State Thruway, New York State Thruway Authority (1951); "Plans, Planners and People: Case Reports from Westchester County on Some of the Human Aspects of Planning" by Hugh R. Pomeroy, Westchester County Planning Department (1955); "Dates Set To Open New Route from the Bronx to Rhode Island" by Merrill Folsom, The New York Times (7/18/1958); "Thruway Opening to New England" by Joseph C. Ingraham, The New York Times (10/18/1958); Arterial Progress 1959-1965, Triborough Bridge and Tunnel Authority (1965); "New England Thruway To Get New Exit Numbers" by Edward Hudson, The New York Times (2/17/1980); "Pioneering in Parks and Parkways: Westchester County, New York (1895-1945)" by Marilyn E. Weigold, Public Works Historical Society (February 1980); "Truck Stop and Rest Area Parking Study," Connecticut Department of Transportation (2000); New York Metropolitan Transportation Council; New York State Thruway Authority; Ralph Herman; Jeff Saltzman; Kevin Walsh; Douglas A. Willinger. I-95, New York State Thruway, and Pelham-Port Chester Parkway shields by Ralph Herman. New England Thruway shield by Alex Nitzman. New England Thruway shield photo by Kevin Walsh. Service area and speed limit signs by C.C. Slater. New England Thruway exit list by Steve Anderson.